The highlight of Exhibition #3 at the Museum of Everything is Ted Willcox’s tapestries. This ex-serviceman learnt how to sew in hospital while recovering from injuries. 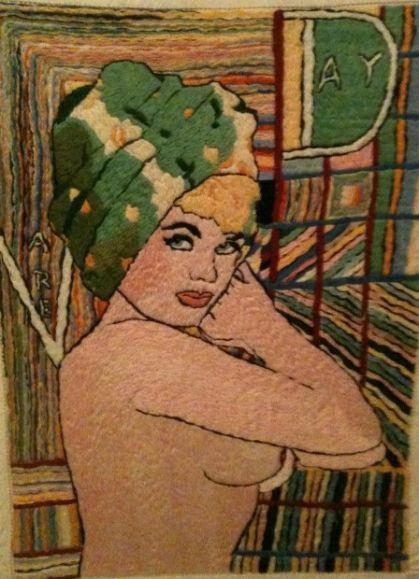 He created embroideries of pin-up girls and his unique version of Alice in Wonderland. I highly recommend checking Exhibition #3 out. Other highlights were Walter Potter’s dioramas (love this) and Arthur Windley’s miniature funfair (which he turned on every morning in his garage). I urge everyone to have an afternoon of discovery. The exhibition is on until Dec 24th. Sleep. Your gateway to dreams. For such an important aspect in life, I sometimes think that there is very little attention paid to the things needed to help make sleep sweeter. The dream cloud offerings from Studio Psycho could help encourage certain themes in your dreams. These idream pillowcases are not to be confused with iDream speaker pillows which have inbuilt speakers and allow you to listen to music or to have “pillowtalks”. 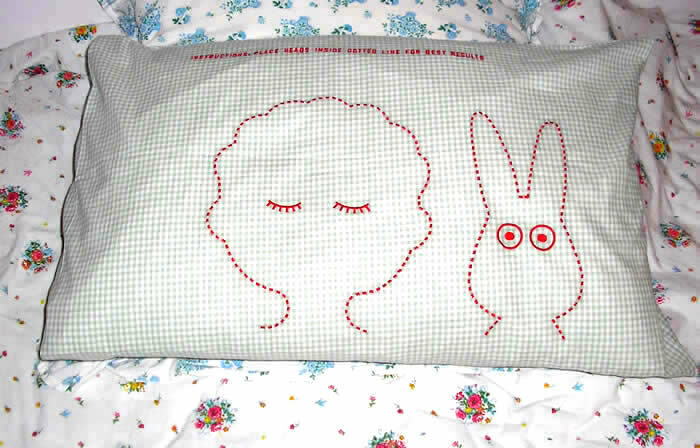 I saw these Miranda July pillowcases in the ICA last year. Oh Miranda July! She never ceases to charm with her twisted humour. How I’d love for her cheekiness to be included in my bedtime. 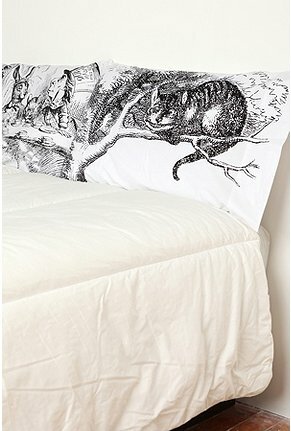 Speaking of funtimes, I love these pillowcases for children spotted on Lapin And Me. Talk about making bedtime fun! I love that it’s embroidered on gingham too. For the adults who don’t want to forget the psychedelic world of Alice in Wonderland, these pillow cases can help you get into the right mood for the film coming out soon! I thought of Topshop’s AW08 Alice in Wonderland inspired collection which I thought was better on paper than in execution. I only came away with some heart print underwear which are cute but nothing out of the ordinary. I am surprised that although the suits make really easy prints for design, I’ve not actually seen much out there. Apart from hearts, the other suits have not really made it as a design for print. It is a bit of a shame really as you can see above clubs make quite a nice little alternative to flowers as a print. I met Elizabeth Lau in Paris a couple of years ago and was really pleased to see her name pop up in quite a few places recently. The amicable designer has a lovely approach with her use of love hearts in her quirky designs. This dress is a nice little example of what I was hoping to find when researching playing cards. Accessories are the finishing touches, so I was pleased to find the handmade jewellery from Joolz found via this blog. The multi-strand pearl necklace is accented with butterlies made out of vintage playing cards. There’s a bit of magic when your space is altered. I love it when the outdoors get mixed up with the indoors and vice versa. The best art installations I’ve seen have mostly been about altering your environment, which is familiar in an Alice in Wonderland kind of way. Last year, I saw some pretty spectacular outdoor/indoor mix-up. I was reminded of this when I was looking at an Anthony McCall image on Chris’s blog. Technically the exhibition I went to in the Serpentine Gallery didn’t really bring the outdoors indoors but it helped fuel my imagination on what it was like to be able to walk towards the sunlight in a midnight sky. This reminded me then of the time when we went to see Roger Hiorn’s Seizure. A flat in a housing estate in Elephant & Castle had been transformed into a crystal house. On a smaller scale, a nice way to bring the outdoors indoors is through something like a tree bed. Having been brought up in the city, I have found nature slightly scary. While I can appreciate nature aesthetically, I am not entirely comfortable with being outdoors. I like that someone has thought to design something for the non-campers out there. Last summer, on a glorious sunny day, I found myself walking along South Bank and stumbled upon the Armchair Theater. But really, the quickest way to bring the outdoors indoors or the playground anywhere is with this swing skirt by Rachel Griffin. I love that with this one simple design, this is fashion that you can wear and play in anywhere, anytime. Easily going back in time and being a kid again.